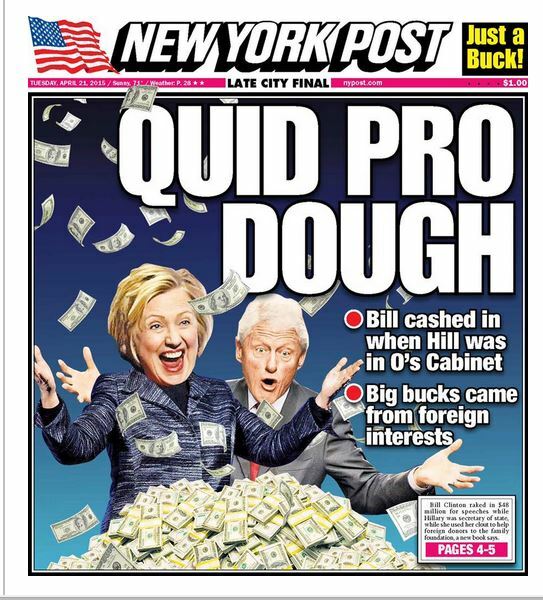 Clinton Cash by Peter Schweizer, alleges that Hillary Clinton’s actions as secretary of state led to millions of dollars in speaking fees for her husband as well as large donations to the Clinton Foundation. One example of an alleged quid pro quo cited by the Times and other sources involved the State Department’s backing of a free-trade agreement with Colombia that benefited a company founded by a big donor to the Clinton Foundation. Hillary opposed the trade deal when running for president in 2008 because of the South American country’s poor record on workers’ rights. But then the company, Canadian-based Pacific Rubiales, and its founder, Clinton Foundation board member Frank Giustra, donated “millions” to the foundation, The International Business Times reported. In 2010, the State Department under Hillary lauded Colombia’s human rights record, allowing Giustra’s company to reap huge profits. During Hillary’s four-year stint as secretary of state, the ex-president earned about $48 million of a $105 million speaking haul amassed between 2001 and 2013. More than half of the $48 million was paid by companies in China, Japan, Canada, Russia, Saudi Arabia, United Arab Emirates and the Cayman Islands, among others.